I was 11 years old and in the 7th grade when I first heard “Stand,” the second single off R.E.M.’s Warner Brothers debut Green, on the local Top 40 radio station in Connecticut. It was the first time I can remember really pondering the intent of the lyrics to a pop song — “Stand in the place where you are, now face west.” What does it mean? Well, it meant that that R.E.M., whose fan base was built through college stations and relentless touring, were now able to reach pop radio listeners who didn’t know any better. Yes, 25 years ago, R.E.M. put the cheeseball pop of “Stand” on Top 40 radio, amid the Astleys and Watleys of the world, a song that for a lesser band might have been a one-hit wonder. And although the Athens, Ga. quartet in the previous year had poked into the top-10 with “The One I Love,” “Stand” was an even bigger hit, reaching number six in the charts. R.E.M., now armed with major label reach and promotion were on their way to being one of the world’s biggest bands. Owing the massive distribution offered by Warner Brothers, Green was the first of the band’s albums to make serious inroads in Europe, where they continued to do well, even as their American sales would diminish in their later years. To commemorate 25th anniversary of Green — it actually came out on Election Day, 1988 — Warner Brothers has reissued and remastered the album and included a bonus disc featuring the Greensboro, N.C. stop on the 11-month tour R.E.M. embarked on to support the record. The band reportedly called it Green as nod to the environmentalism they long championed, and because this was their first offering on major label, having jumped from the legendary I.R.S. Records, the previous year. The remaster, even on iTunes, enhances the fit and healthy crunch to the songs, as the band marked a definite schism with the much loved kudzu-jangle of the early albums. Singer Michael Stipe’s vocals had long emerged from their Murmur-era murk and there were some obvious advances in his lyrics and performance. There’s the studied insouciance on “Pop Song ‘89,” as he asks “Should we talk about the weather/Should we talk about the government?” over Peter Buck’s bubblegum and Byrds-style Rickenbacker guitar shimmy. On “World Leader Pretend,” Stipe uncorked one of his best lines: “It’s high time I’ve raised the walls that I’ve constructed.” Though, when sung, he could be referring to “raze.” That’s a clever and confident writer at work. The mandolin and accordion-laden nocturne, “You Are The Everything,” one of the most beautiful songs the band ever wrote, is now in retrospect the passageway to the acoustic songs that would dominate Out of Time and Automatic for the People. But there aren’t many surprises that leap off of Green in its 25 years. The best songs, like lead-off single “Orange Crush,” kept their looks, but weaker cuts such as the turgid “I Remember California” and the pretty, but rudderless “Hairshirt,” haven’t improved with age. Another quibble is that Warners didn’t include any of the Green-era flipsides, such as the instrumental “Memphis Train Blues,” and covers of Syd Barrett’s “Dark Globe,” the Ohio Players’ “Skin Tight” and Iggy Pop’s “Funtime.” Still, the 21-song live record makes this reissue worth getting. 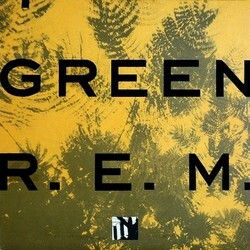 Recorded in Greensboro toward the end of the worldwide Green tour, it demonstrates that R.E.M. graduated from club and theaters to arenas with full honors. This is vital stuff. The tour so exhausted the band that they retreated to the studio, to emerge two years later with “Losing My Religion,” the song made the band big-time, for real, no kidding, famous. They didn’t stay green for very long. May 16, 2013	Album ReviewsR.E.M.